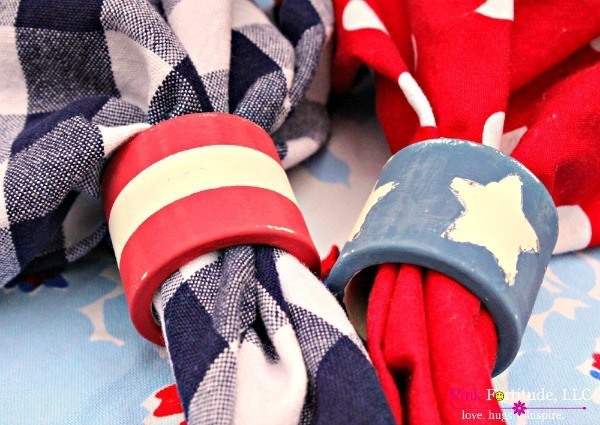 I found a set of boring red napkin rings at a yard sale, and knew right away I wanted to turn them into something special for the 4th of July. 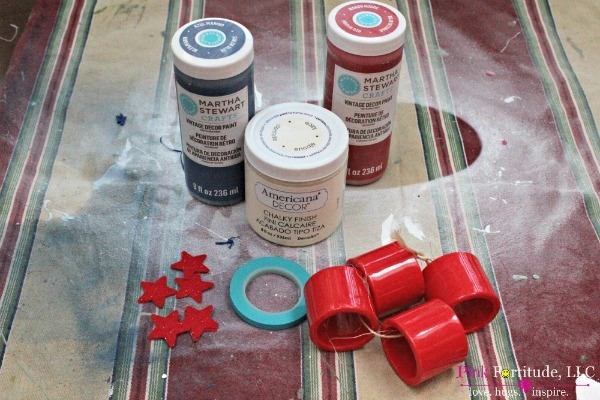 Check out the trash to treasure DIY! Is it weird to admit that I’ve been scared to try milk paint? I mean… I kicked cancer’s a$$ and survived four rounds of chemotherapy… but craft projects scare me. Trying new things scare me. 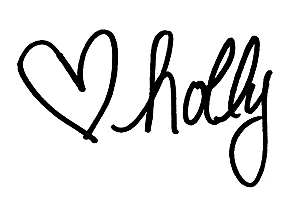 New craft projects…. Mommy hold me!!! But I did it. And if I can do it, so can you! 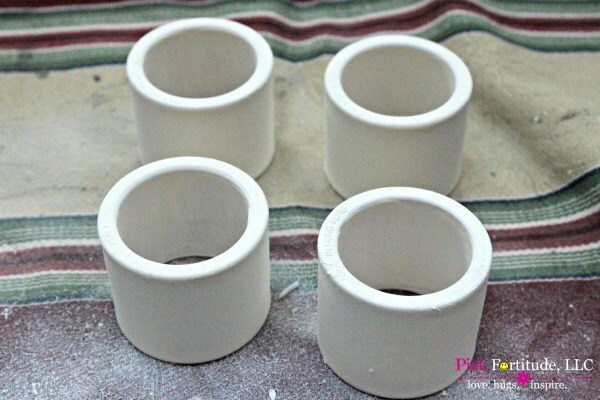 When I tried to apply the white milk paint directly onto the red napkin rings, it slid right off. So I sprayed them down with regular ole white spray paint and gave them a few coats to hide the red. Next, I took a sanding block and gave each of them a little rub down to make it easier for the milk paint to stick. It worked! I applied each napkin ring with four light coats of milk paint to thoroughly cover. 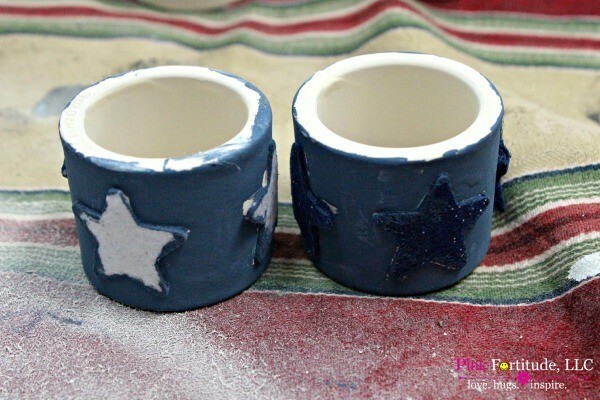 Next, I took the star stickers, and placed them on two of the napkin rings, and painted over with the blue paint. The blue paint was a little more saturated, so I only needed one coat plus touch up. For the other two napkin rings, I used the painter’s tape to mark off stripes and then painted red strips to the top and bottom. I used two coats of red paint to ensure full coverage. I removed all of the tape and stickers, and only needed a little touch-up. The final step was to give each of them a little more sanding rub down for a distressed look. And here they are… the pride and joy of our 4th of July tablescape! 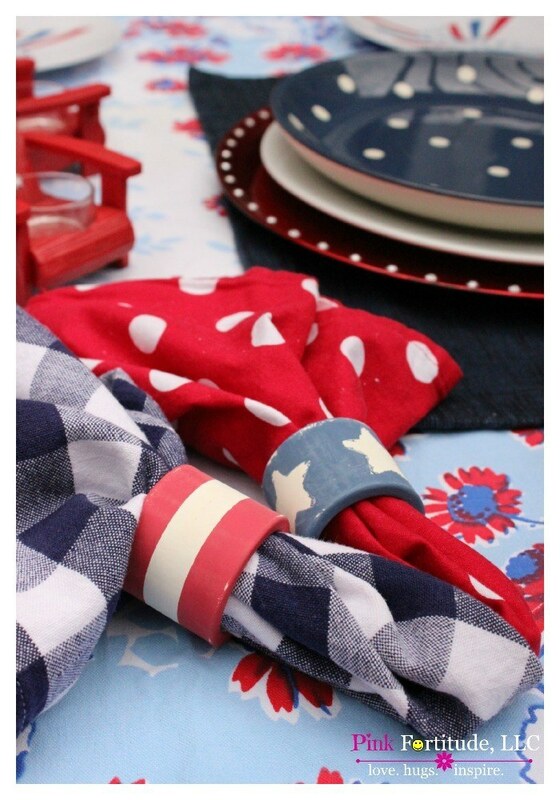 Lots of stars and stripes for a patriotic table setting! 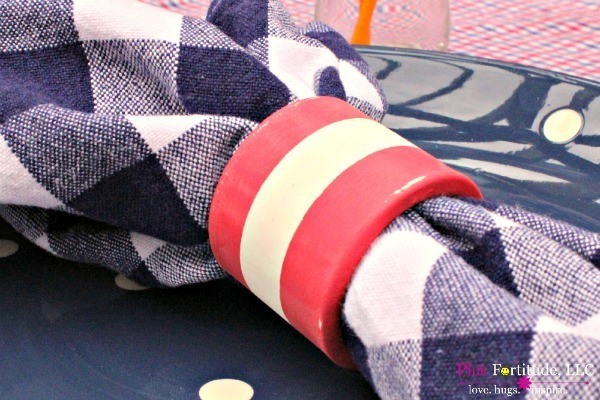 I had fun mixing and matching the red striped napkin rings with blue checked napkins…. 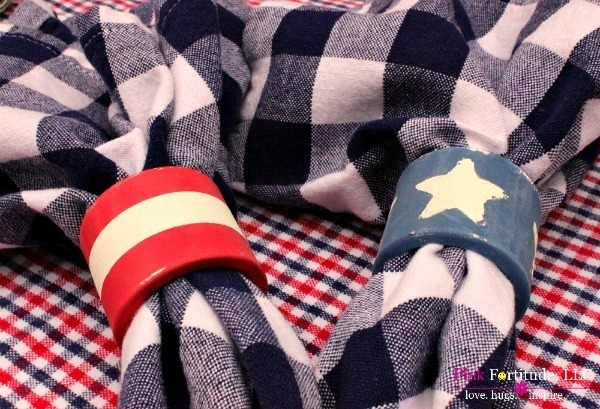 … and the blue star napkin rings with red polka dot napkins. I’m excited because I’ve had another project up my sleeve for a while, but I wanted some practice and to be comfortable with the milk paint. I’m totally hooked! Love the Red, White & Blue? CLICK HERE for more patriotic articles. Be sure to pin to your 4th of July or patriotic Pinterest board… cuz I know you got one! Love, hugs, and no fear. Holly, you crafter you! 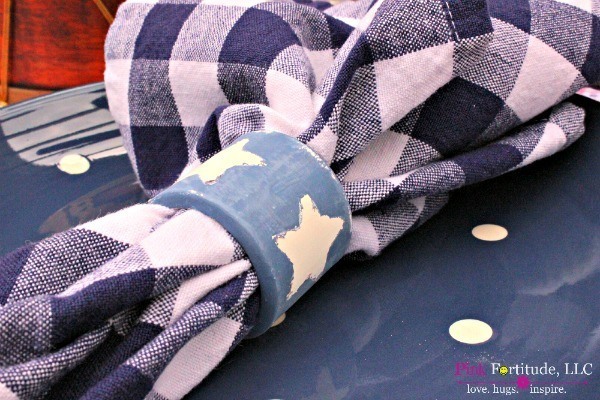 I lo-ove these napkin rings and that you upcycled them. You better keep your eye on them or might have to figure out a way to borrow them. These are so cute and easy to do. I love red/white/and blue. Thanks for sharing. Cute Holly! I love the big stars and stripes! I love these, especially the blue one! These are absolutely adorable…what a great idea! 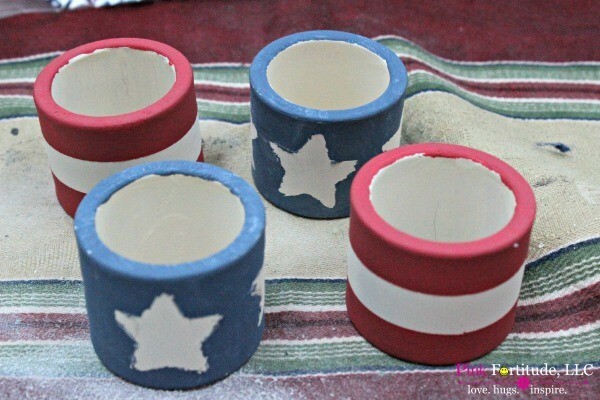 I used the same method last year to do mini flower pots! :0) Your napkin rings are just too cute!!! Hi there! 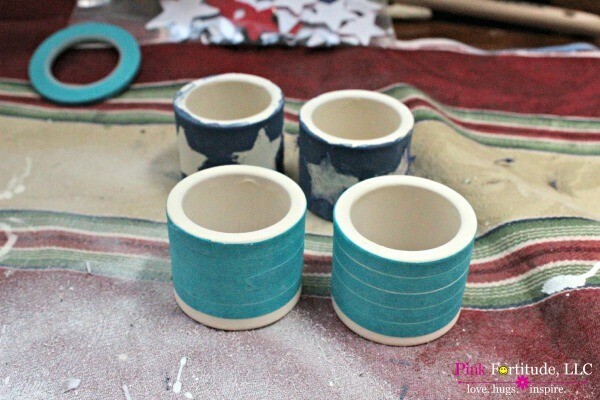 I love this craft, and I’m featuring it tonight as my pick for the Merry Monday Link Party! Thanks for linking up, and can’t wait to see what you’ll link up next! These are so cute!!! I love a good craft. 🙂 Pinning!! Thanks for linking to Tips & Tricks. Can’t wait to see what you link up next.